"Where all the print is blood, where all the pages are my days..."
"What an amazing work--a labor of love and a definitive record. I had a feeling someone was out there, someone noticed... Thanks for collecting all the scattered bones, for making history come alive. And thanks for the memories!" Published by Greenwood Publishing in May, 1997. The Grateful Dead and the Deadheads: An Annotated Bibliography contains annotated entries for over 2800 separate books, articles, papers, and chapters about the Grateful Dead's 30-year history and its fans, a unique group in American popular culture who have their own identity, the Deadheads. It includes every book published about the band, every article which appeared in a major magazine or journal, chapters and entries in books, and articles from The San Francisco Chronicle and The San Francisco Examiner newspapers. The Grateful Dead appeared on the San Francisco music scene in 1965, and over the course of their career inspired a wide array of writing, ranging from feature stories to fiction, from ecstatic discourses to academic dissections, and this bibliography includes the entire spectrum. Many entire magazines were devoted (and remain to be devoted) to following the band, and this bibliography chronicles the material which appeared in those fan magazines, which include Spiral Light , Unbroken Chain , Mikel , Relix , The Golden Road , and Dupree's Diamond News , none of which is regularly indexed in standard sources. The indexing is thorough and includes, in addition to the normal author, subject and title indexes, an index to artists and photographers, since the Grateful Dead has inspired a large body of artistic and photographic work. 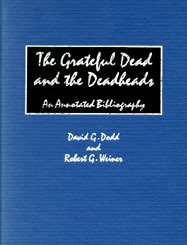 "If you want to learn the printed history of the Grateful Dead, read David Dodd and Rob Weiner's bibliography. It's a long strange trip, and they're the librarians for it." G.D. publicist and official historian. "For thirty years, the Grateful Dead made a glorious call into the world. David Dodd and Robert Weiner's annotated bibliography is the world's answer, chronicled with impeccable scholarship and a love for their subject that shines through in every line. "Catalogued here, for future researchers and Deadheads-to-come, are the interviews and scribes, the pop-crit ruminations and the academic nets cast, the nearly forgotten tales of would-be anthropologists gone native - a magician's library of hilarious and significant lore rescued from the abyss: all the luminous ephemera and era-defining milestones accumulated as the Dead streaked through the American sky on the trail of the Wild Good. "Perhaps the best thing I can say about this exemplary record is that if it had existed before David Shenk and I wrote Skeleton Key, our job would have been much easier." Years ago I decided that if the Grateful Dead deserve a place in history, we'd better get started on those books and papers and articles. Dodd and Weiner have done an impressive job of gathering and annotating the mountain of material that has emerged over the years. This book is absolutely essential reading for anyone who is interested in this fascinating, sprawling field of musical and cultural interest. See Nicholas Meriwether's review of the bibliography (mostly favorable) at Enterzone. ...I can hear you asking. You can order through Greenwood Press at their online catalog.